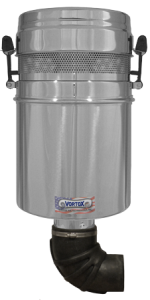 Vortox Air Technology bottom outlet air cleaners are designed for applications where ground clearance is critical. the 5" diameter bottom outlet is coupled to an elbow either 5"x5" or 5"x4" to provide maximum flexibility in mounting to the blower. We take great pride in our quality, craftsmanship, and finish, which can be seen in every air cleaner we manufacture. One look at a Vortox Air Technology air cleaner will make you forget about the others.